Ever wondered about the other half of Sea/Tac? After flying into Seattle a dozen times, Vegetarian TravelingMom finally went southwest where she found a wealth of free fun things to do in Tacoma, Washington. Best of all, these free fun things in Tacoma are all family friendly. Most SeaTac tourists are Seattle, or cruise ship bound, but it would be a shame to miss all that Tacoma has to offer. This gritty city, which enjoys (or endures) the same climate as Seattle, has a charm all its own. It’s also a little more low-key than Seattle, with lower-priced hotels and restaurants. Even parking downtown is a bargain; just $1 for two hours. Read on for 7 free things to do in Tacoma. To get to the Car Museum, the Tacoma Dome, or other downtown museums, hop the free light rail. This 1.6 mile rail is perfect for kids who love to ride trains. 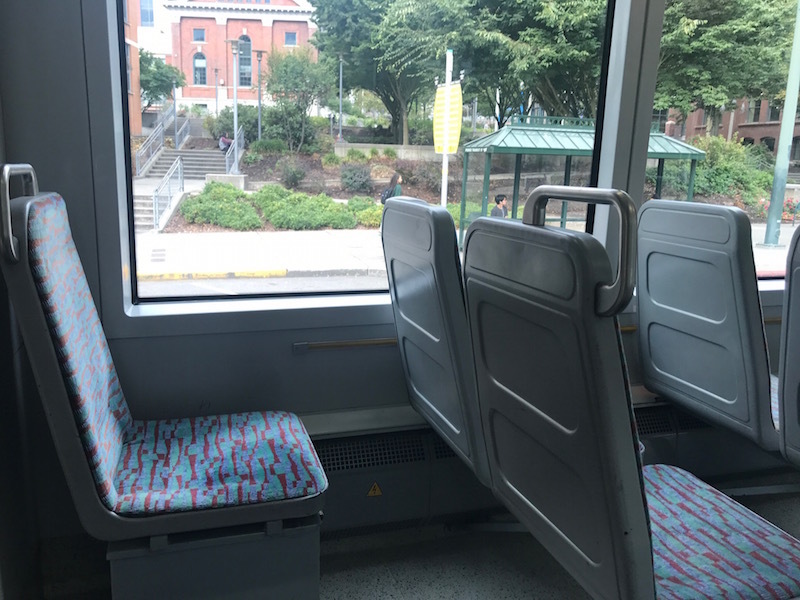 The streetcar easily accommodates strollers, bikes and wheelchairs. The system will eventually expand to the airport; for now, you have to take an express bus into Tacoma, or a cab. The light rail runs daily, with streetcars spaced about 15 minutes apart. Right on the Tacoma light rail, the Children’s Museum of Tacoma offers Pay As You Will admission. You are not compelled to give anything. Exhibits include a wooded play structure, with a special toddler area, a water play area, and a ship where kids can “sail” on an adventure. There is also a creative art studio, dramatic play space, building opportunities and a quiet area where kids can read. 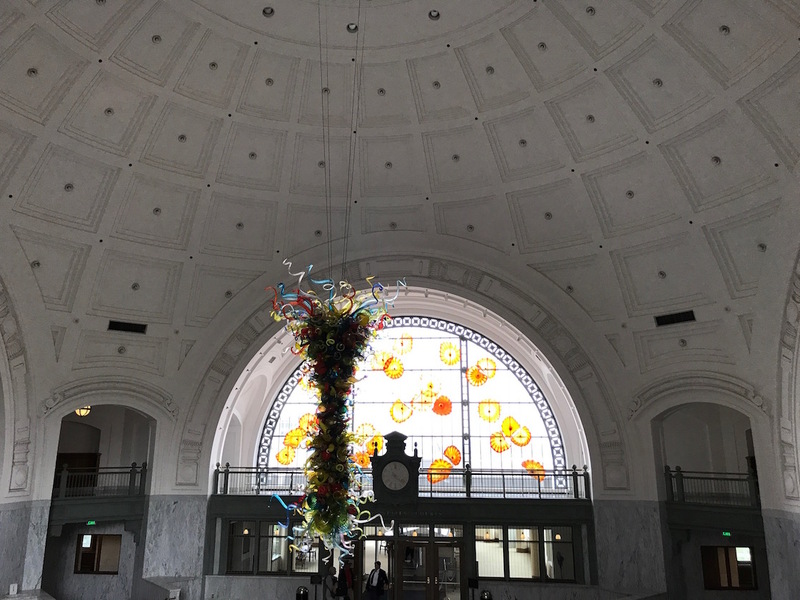 In the old Union Station, now the federal courthouse, you just have to show ID and you can see magnificent Chihuly works of art. 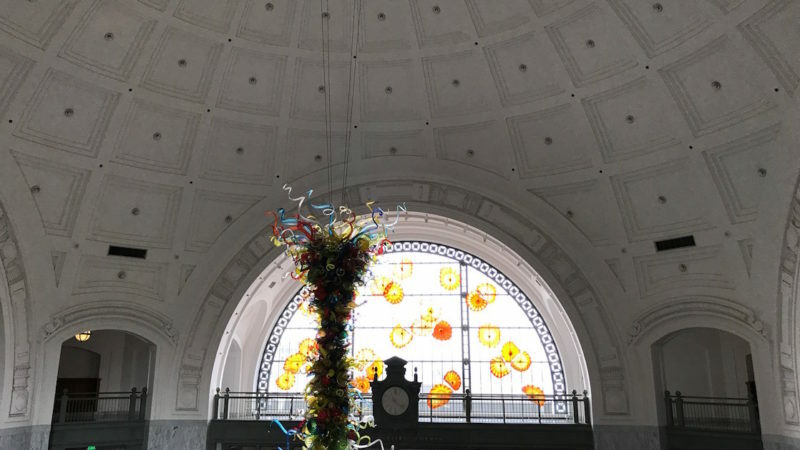 Dale Chihuly donated the five artworks, which include a huge chandelier. Make sure you go to the lower level of the building to see historical photographs and artifacts from the train station era. The Chihuly Bridge of Glass, a pedestrian bridge that opened in 2002, connects downtown Tacoma to the waterfront. 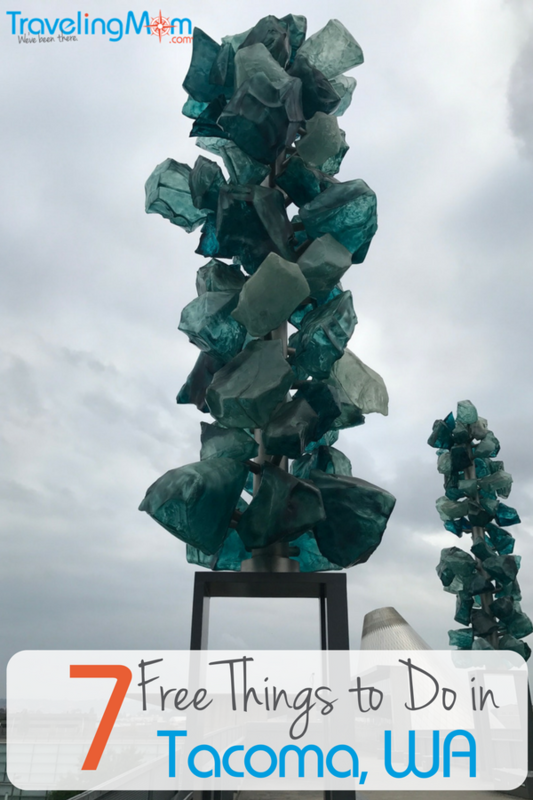 It also serves as an outdoor gallery of Chihuly works. There are two 40-foot towers of giant blue crystals, a walk-through pavilion with a ceiling of 1,500 glass “Seaforms” and a wall of Venetian vessels. The bridge takes you from the Tacoma Art Museum to the Museum of Glass. Bill it as a museum to entice kids who are art museum averse. The W. W. Seymour Botanical Conservatory at Wright Park features over 250 individual plant species and hundreds of orchids. The conservatory, opened in 1908, anchors Wright Park, an arboretum filled with specimen trees. There is also a large playground in the park. Children’s story hours and music performances at the conservatory have a suggested $3 donation. Fort Defiance Park, which juts out into Puget Sound, has a museum and a zoo, both of which charge admission. It also has a scenic five-mile drive. If you went to the car museum, taking this scenic drive might remind you of when cars were designed for sightseeing not taking kids to soccer practice. The drive is closed to traffic in the morning, so bikers and runners can exercise in a car-free area. But you can walk the trails, free of car traffic and bicycles, throughout the day, and see the beaches and gardens in the park. The drive is closed to traffic in the morning, so bikers and runners can exercise in a car-free area. But you can walk the trails, free of car traffic and bicycles, throughout the day, and see the beaches and gardens in the park. This boutique hotel has a gallery of glass art, including a Chihuly vase and rare Chihuly pencil drawings, open to the public. You can also see a car from the museum in the lobby (they are switched out regularly) and glass art from local artists on the mezzanine level, where the restaurant, Bite, is located. 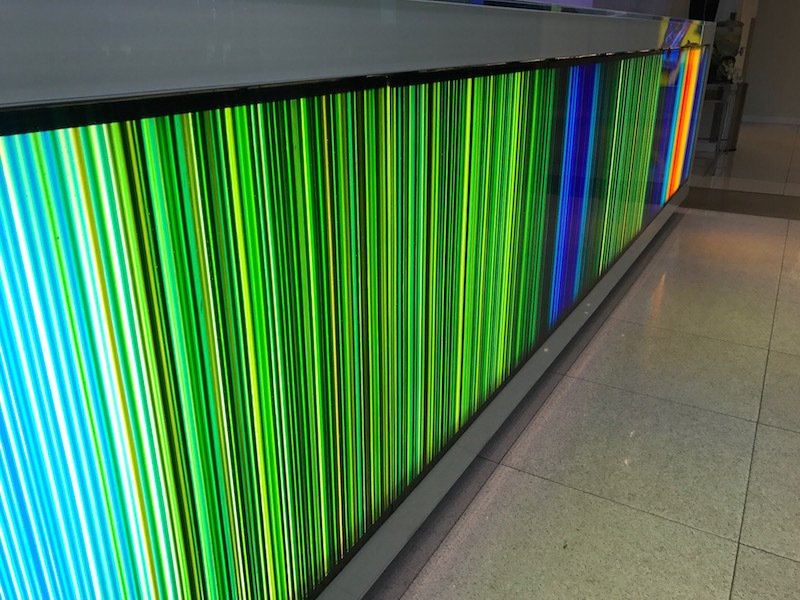 The check-in desk is also truly spectacular. 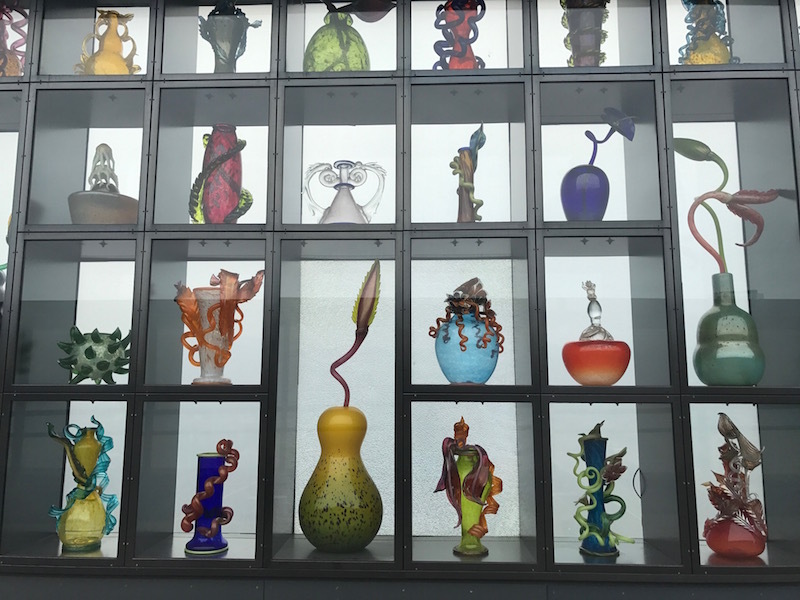 If you stay at the Hotel Murano, be sure to explore every floor; each floor features a different glass artist. On the Third Thursday of every month, museums are open late and offer free admission. The Washington State History Museum is free from 2 pm – 8 pm and the Tacoma Art Museum and the Museum of Glass are free from 5 pm to 8 pm. The Foss Waterway Seaport is free from 4 pm – 8 pm. And downtown art galleries stay open late, so you can meet the artists and see local works. After you hit the free things to do in Tacoma, you can splurge on LeMay – America’s Car Museum. This museum showcases shiny automobiles, from vintage roadsters to zippy performance cars. Tacoma Dome, next to the museum, hosts arena concerts and monster truck rallies. Note: for a bargain day trip to Tacoma from Seattle, an express bus takes about 50 minutes and costs just $3.75 per person. There is also a train, but it only runs during rush hours. One note: it is Point Defiance Park, not Fort Defiance. There is a Fort in the park, but that is not the name! Thanks for shining a light on my hometown!